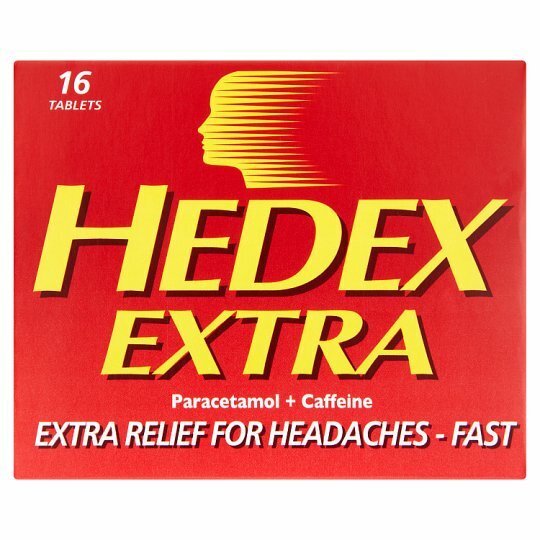 Hedex Extra tablets are formulated to provide extra relief from headache including migraine and tension headache. Also suitable for backache, rheumatic and muscle pain, toothache and period pain. Hedex Extra also relieves the fever, sore throat, aches and pains of colds and flu. The tablets are coated and shaped to be easy to swallow. Contains Paracetamol and Caffeine for fast effective pain relief. Take 2 tablets, with water, every 4-6 hours as required. Do not take more frequently than every 4 hours. Do not take more than 8 tablets in 24 hours. Take 1 tablet, with water, every 4-6 hours as required. Do not take more frequently than every 4 hours. Do not take more than 4 tablets in 24 hours. For professional advice on medicines consult your pharmacist. DO NOT EXCEED THE STATED DOSE Immediate medical advice should be sought in the event of an overdose, even if you feel well. DO NOT TAKE Contains paracetamol. Do not take with any other paracetamol-containing products. Avoid too much caffeine in drinks like coffee and tea when taking these tablets. CONSULT YOUR DOCTOR Before taking this medicine if you have liver or kidney disease, including alcoholic liver disease. If your headaches become persistent, see your doctor. If symptoms persist consult your doctor. Keep out of the reach and sight of children.